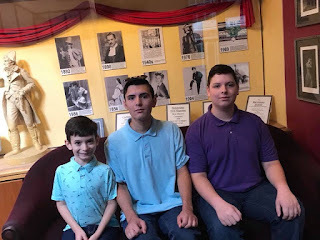 A RUP LIFE: Disney's Aladdin Jr. at the Walnut Street Theatre in Philadelphia! Disney's Aladdin Jr. at the Walnut Street Theatre in Philadelphia! I love the theatre. I remember taking field trips in grade school to see shows. I remember seeing The King and I, Our Town, A Christmas Carole and so many more. These were memories that lasted because seeing them performed is magical! The costumes, lights, music and makeup take you away from the outside world. My third child is only 7 so he hasn't had the opportunity to see a play until now. He had no idea what to expect but I knew that Disney's Aladdin Jr. would be a great show to take him to on his maiden voyage. Living in Southern New Jersey means we are just outside of the city. My husband dropped us off right out front of the theatre. (In the past I've taken the speedline which is pretty easy too.) We arrived about 25 minutes early for the 1pm show and it was perfect timing. J-man was so excited as we walked into the auditorium. 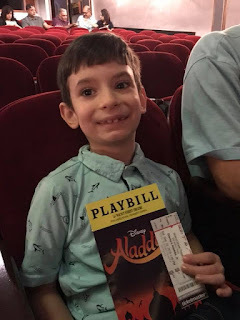 He was handed a playbill and we made our way to our plush red seats. The stage was set and we had just a little bit of time before the show started. When it started the magic took over. I saw my son looking at the performers watching their every move. He was enthralled - as I knew he would be. This was a great show. The music numbers were fantastic. There was a wonderful blend of the story we know so well and the adaptation for the stage. Honestly there wasn't a dull moment. The Actors and Actresses were so talented! The show had plenty of humor written in. I loved Genie! Her smile lit up the stage! Iago was hysterical! The hour length was perfect. All the major moments I wanted to see were covered - Jasmine and Aladdin fans won't be disappointed! We really had such a good time. The kids are already talking about what show we will go see next! 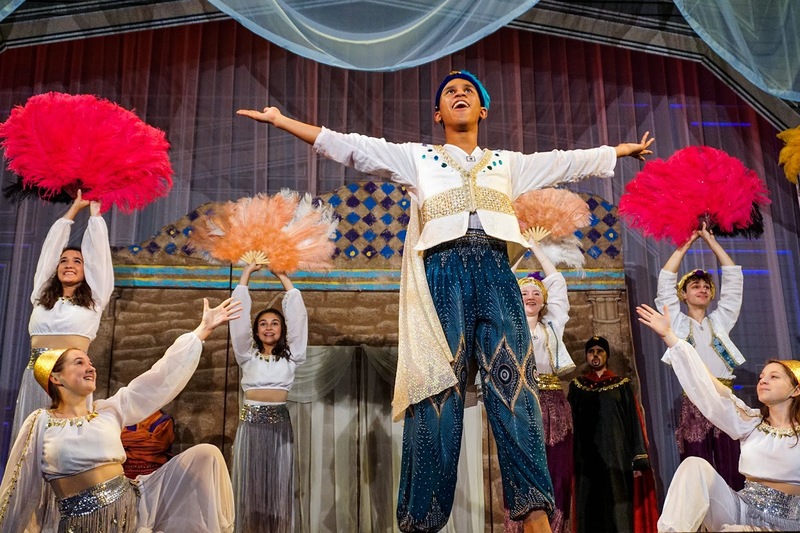 Disney Aladdin Jr runs from September 22-30, 2018 at the Walnut Street Theatre (825 Walnut Street, Philadelphia, PA.) Tickets range from $15-18 and can be purchased at www.WalnutStreetTheatre.org or Ticketmaster. 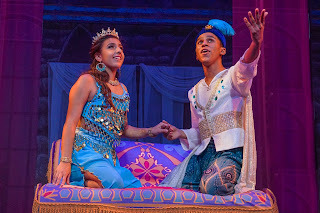 ARupLife.com received tickets to Disney's Aladdin Jr. at The Walnut Street Theatre to facilitate this review. This post may contain affiliate links, which means that by clicking on an affiliate link I may receive a small amount of money. We only give our honest opinions of products. This post is in accordance with the FTC 10 CFR, Part 255 concerning the use, endorsements or testimonials in advertising. 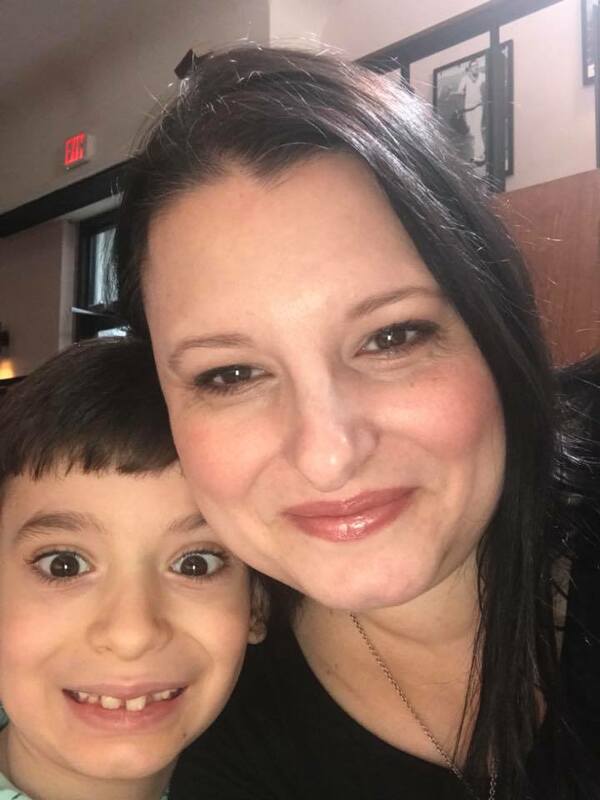 Lisa Rupertus/ A Rup LIfe is a participant in the Amazon Services LLC Associates Program, an affiliate advertising program designed to provide a means for sites to earn advertising fees by advertising and linking to Amazon.com.